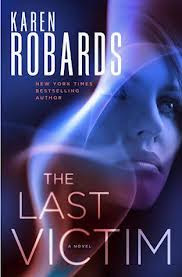 I've read many books this summer (around 35+, so don't expect many reviews), but Karen Robards' The Last Victim (Ballantine, Isbn-0345535405) is one that I feel deserves a special response, an immediate review. Synopsis : Fifteen years ago, young Charlie Stone was the only one to escape the Boardwalk Killer. Now an eminent psychiatrist whose speciality is serial killers, Charlie is called in by the FBI when a series of similar murders rock the town of Kill Devil Hills. Because of her ability to see the ghosts of those who've recently died violent deaths, Charlie is shocked to find that the ghost of her most recent patient, drop dead gorgeous serial killer Michael Garland who died in her arms, has attached to her and refuses to "go towards the light". As the killings escalate, Charlie finds in Garland a reluctant ally and a growing attraction that refuses to die, even as her head tells her that the living, breathing FBI Agent Tony Bartoli is a better prospect than the ghost whose kisses are killer. The resulting suspense holds the reader spellbound. Expecting another cliched serial killer story, I almost didn't pick up this book. But I'm glad I did and the only reason for that is the unexpected factor - the irreverent and irrepressible ghost of serial killer Michael Garland. At first, I felt uneasy to read about Charlie's attraction to a serial killer. My doubts were somewhat mollified when Charlie's own thoughts make it clear how sickening she herself finds those feelings to be. I was never so surprised as when Garland's ghost makes an appearance, or later on, decides to stay. The tart conversations between them as Charlie tries to repeatedly get Garland to go "towards the light" and he refuses to do so, made for very humorous and engaging reading and were the driving factor behind me reading the whole book in one shot. Still...no matter how often or how hot Charlie found Michael to be (dead or alive), I continued to be doubtful about the whole "attracted to a serial killer" bit. But Garland's actions, whether in trying to protect Charlie from another ghost or a real live threat, repeatedly prove contrary to his background as a man who gruesomely murdered seven women. Obviously this is the author's way of redeeming Garland by perhaps proving him to be an innocent man in subsequent books (I believe this book is the just the start of a new series). Now this is a key factor to keep in mind. Garland is redeemable (in the future) and that makes it more acceptable (here, in the present) for him to become Charlie's lover and the improbable hero of this book (and perhaps even this series?). That made this book more acceptable and indeed, a hundred times more enjoyable for me. Like Charlie, I quite like Michael Garland, and am fully willing to give him the benefit of the doubt. It all hinges on in what light he'll be shown in the next book in this series, which I'm quite eager to read. This book does leave a lot of questions unanswered, but since it's clear there are more books in the offing, I'm willing to wait and watch and hopefully all will be answered in due time, such as - why only Garland's ghost can change his appearance so quickly after his death, while other ghosts are unable to. The whole murder mystery actually gets sidelined for a while by this budding romance and I'm actually not at all displeased by it. In most such books, the relentless and ruthless pace of both the hunter and the hunted (plus the gore) is apt to leave a reader feeling quite emotionally wrung-out. That's not the case here. Here the reader is offered a welcome respite from the killings in the form of a potential romance triangle involving Charlie, Tony and Michael. But never fear - the good guys do more than their share of hard work and the whodunit part of the mystery proves to be robustly complex. There are other side characters whose own spicy inter-personal relationships add a new dimension the plot. Overall, I'm quite impressed with this book and I look forward to reading the next one. My hope is that the author will do something more with the romance triangle she briefly introduced in this book. This book was received for review consideration.